Use the links provided to view results for state, youth, and mail-in tournaments as they become available. 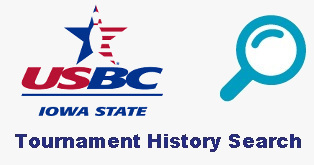 The April 2019 edition of the Iowa State USBC Bowler newsletter is now available. $1000 per year scholarship to award deserving youth female and male bowlers for their accomplishments on the lanes, in their communities and in the classroom. Scholarships are renewable for up to four year for a total of $4000 if qualifications are met. Tournament fees may be electronically paid for the following tournaments in the 2018-2019 season. Visit the Point & Pay site to pay your tournament fees. Completed entry form MUST be emailed or faxed the same day to the IAUSBC Association Manager office. The Iowa State USBC Women's Bowling Association, Inc. merged with with Iowa State USBC Bowling Association, Inc. and the Iowa State USBC Youth Bowling Association on August 1, 2018 thereby bringing all bowling in Iowa into one organization.